AUST GR.CH. 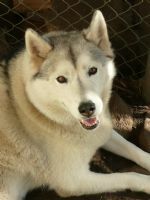 CHUKCHII ANTARCTIC FROST "KKADO"
"KKADO" WAS OUR FIRST SIBERIAN HUSKY. PURCHASED AS A MISCHEVIOUS BABY PUPPY IN 1992. 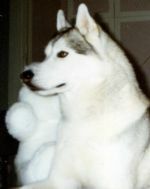 "KKADO" WAS TASMANIAS FIRST GRAND CHAMPION SIBERIAN HUSKY. HE WAS A MULTIPLE BEST IN SHOW, BEST IN GROUP, CLASS IN GROUP AND CLASS IN SHOW WINNER. IT WAS A PRIVILEGE TO HAVE KNOWN, OWNED AND LOVED HIM. 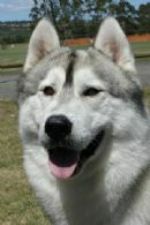 AUST CH TEASHA BROOKLYN "BROOKLYN"
AUST CH TEASHA BROOKLYN "BROOKLYN". "BROOKE" WAS A RUNNER UP IN SHOW, BEST IN GROUP, CLASS IN GROUP AND CLASS IN SHOW WINNER. SHE HAD AN OUTSTANDING TEMPERMENT. 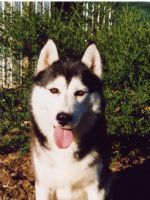 IT IS A PLEASURE TO HAVE BEEN OWNED BY HER....SADLY WE LOST "BROOKIE" AT THE AGE OF 8 1/2 YEARS AS THE RESULT OF AN ILLNESS. CHAMPION GELDERLAND THE GAME IS OVER "SKAIFE"
CHAMPION ICEPOWER EQUINOX E.T "BREEZE"
CHAMPION ICEPOWER APPARITION E.T "RISH"
Aust CH GELDERLAND ENVY OF EVERYONE E.T. 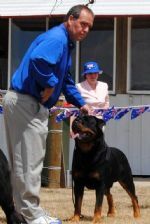 "HAYDEN" was a multi Best in Show, Best in group, Class in show and Best of Breed winner. RIP "HAYDEN"
"Kabanae Let Me Fly" or "Willow" as she was known to her family ... "Willow" was from our "Kkado" x "Brooklyn" litter and was dearly loved and owned by Jo and Jack Osbourne, Hillwood RIP "Willow"